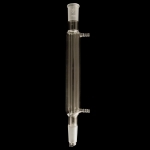 Condenser has an upper taper outer joint and a lower inner drip tip joint, both of same size. Hose connections have an O.D. of 10mm at the middle serration. Upper/lower joints 24/40. Length of jacket 200mm. Upper/lower joints 24/40. Length of jacket 300mm. Upper/lower joints 24/40. Length of jacket 400mm. 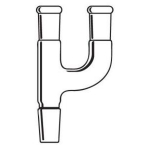 Upper/lower joints 24/40. Length of jacket 500mm. Outer and inner joints size 19/22. Effective length 180mm.